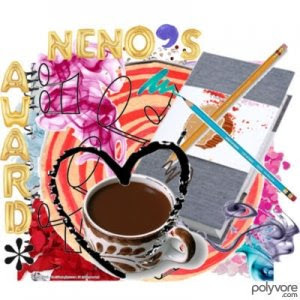 Many thanks to Beth N., who surprised me with this very special Neno’s Award! I am touched and honored both by the award and by her fountain of encouragement. Thank you, Beth! Why we all love blogging. Linda’s beautiful mixed media artwork and creative spirit are an inspiration, and her gentleness and generosity are reflected in her lovely creations. I have the great pleasure of knowing her in person, and am so grateful to her for her encouragement along my blogging journey. Thanks, Linda for your friendship – you are a lovely soul. Lyneen is truly the Queen of Cards! If you want to know the latest scoop on what’s new in the scrapbooking – card making – blogosphere, check out her blog. Her enthusiasm and energy will rub off on you, both in person and through her posts! I am blessed to also know Lyneen in person and am so grateful to her for her encouragement and blogging tips. Lyneen, thank you for your friendship and for bringing so much laughter into our world! Eva is a gifted, talented writer. Her vivid imagery is captivating and her life wisdom inspiring. Her words from the heart will surely touch yours. Thank you, Eva, for sharing such beauty through the written word. Elizabeth’s photography and digital artwork will blow you away – such rich, layered images and soulful colors. Impressive and thought-provoking. Thank you, Elizabeth, for sharing your beautiful creations! Although Beth gave me this award, I’m not shy – I’m giving her one right back! She truly embodies the nature of this award. Her friendship through blogging has been one of life’s nicest surprises and has encouraged me beyond measure. Her amazing artwork and boundless imagination will capture your heart. Thank you, Beth for sharing your unique way of seeing the world! Cathy, this is so sweet of you to honor me with this award...thank you! Thanks for the honor... I am just getting around to my recent awards.